The Best Model A Exhaust available! Authentic Exhaust 1928-31 Steel. An exact copy that has been reproduced to the original Ford blueprint. Correct baffles for exact back pressure. All bends are mandrel bent. Same gauge metal as original and USA made! Oversize item! UK Delivery only. Exhaust clamp bolt set 1928-31. Cadium plated bolts with brass nuts for the front muffler clamp. Set of 2. Made in USA. Just what your co-pilot was asking for! This heat deflector bolts right onto your exhaust system in 10 minutes! Forces the exhaust heat down away from your floor. Made in USA. Exhaust clamp for the left hand drive 1928-34 4 cylinder. A 100% original super heavy duty ductile iron clamp. Made with cad bolts and brass nuts. Same as the A-5251 clamp except that this one has a grey cast iron finish that is baked in an oven to withstand high temperatures. The grey finish looks very similar to the original cast iron. Right hand drive exhaust clamp for the model A Ford. A common problem with the standard exhaust clamp, is avoiding the right hand drive steering column, with the head of the bolt coming through the clamp. This clamp eliminates the cumbersome nuts, so that installation is much easier. One half of the clamp is tapped for bolts to simply thread into. 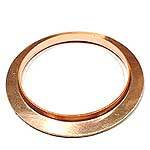 The Copper flanged gasket that fits between the original manifold and the exhaust downpipe on the Model A Ford. Made in USA. The classic tin of Holts Gun Gum. Perfect for sealing round the front exhaust joint, before securing the exhaust clamp. Standard Exhaust sleeve for the 1928-31. This little gadget slips between the muffler and the manifold to prevent leaks. Use with the A-5251-ES seal. Due to manifold variations, it is sometimes necessary to cut a slit in the sleeve where it slips in the manifold. Made in USA. This is a 7 1/2 inch pipe. Larger on one half to enter into the manifold while the smaller end slides into the tail pipe neck. This will let the exhaust pass straight through without leaking around clamp. Pipe only. Diameter of manifold end of pipe is 1 13/16". If manifold opening is larger because of rust deterioration, order the A-5234-B. Larger version of the A-5234-A exhaust sleeve . Larger on one half to enter into the manifold while the smaller end slides into the tail pipe neck. This will let the exhaust pass straight through without leaking around clamp. Pipe only. Diameter of manifold end of pipe is 1 7/8". This is a copy of the old Aermore exhaust whistle. This one is made with copper tubing. Unless you want to fabricate your own fittings, you will need the T-18751 and the T-18753 to mount it on a Model T. or the A-18751 to mount it on a Model A. Exhaust Whistle Adapter for the Model T Ford. This unit splices into your exhaust pipe to act as a valve for an exhaust whistle or an exhaust cut-out. Note: The T-18753 elbow is included. Made in U.S.A. Exhaust Whistle Elbow for the Model T Ford. This is a universal style adapter that is made to splice into the 1-3/4" Model A exhaust tubing. 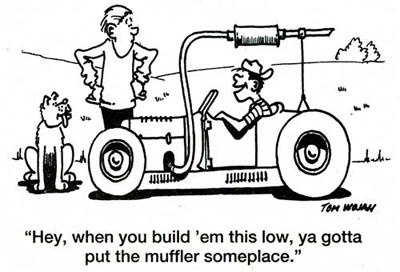 It is not made like the original one for the Model A which was a casting that mounted between the manifold and the muffler. Exhaust tail pipe clamp 1928-31. This clamp hold the tail pipe to the frame. Not needed if you are ordering A-5256-C. Authentic Exhaust clamp made to suit the Authentic exhaust. This one has the added benefit of having a fabric insulator which keeps the clamp and tailpipe from rattling when the tailpipe is cooling. Exact duplicate of the old original clamps that held the tail pipe to the frame. MADE IN USA. Tail pipe clamp bolt set for the 1928-31 Model A. This is the original style special drilled bolt with castle nut & cotter pin. Made in USA. Premium Exhaust clamp for the 1928-34 4 cylinder Model A and B engine. This clamp is made exactly to the original Ford drawings. 1. Made from steel - it will not break or crack and can be twisted and bent without breaking. 2. Bolts are Grade 5 high strength zinc plated. Fine Thread. 3. Nuts are small pattern brass. 4. The MARC judging committee un-officially says they cannot tell this one from an original. All Clamps are painted with High Temperature Black Manifold paint.